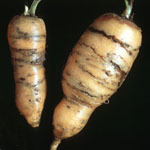 Carrots are produced almost year-round in the UK. 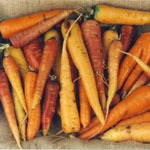 We aim to provide solutions to major challenges to carrot production through an understanding of crop genetics and pest and disease biology, combined with novel management approaches. The 1600+ accessions in the Genetic Resources Unit carrot collection include varieties, landraces and related wild species. The collection is used by researchers and breeders from around the world to understand trait genetics and introduce novel material into breeding programmes. The Vegetable Genetic Improvement Network (VeGIN) is a Defra-funded project to bring together research focused on key vegetable crops. The Network encourages collaborations between industry and researchers to address how genetic improvement of crop varieties can contribute to a sustainable increase in food production to meet the twin challenges of food security and climate change. 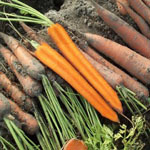 A Carrot Diversity Set is being constructed and will be available on request. It will provide an efficient method of screening a common set of lines for traits and allelic diversity. Software to aid decision-making about pest control (carrot fly, aphids, cutworm) is developed and distributed (www.warwick.ac.uk/go/morph). New agrochemicals and breeding lines are evaluated in laboratory and field trials. 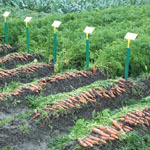 A population of carrot fly is maintained in the field for insecticide and host plant resistance trials. Alternative methods of pest control are developed and evaluated e.g. physical barriers to exclude carrot fly.